Clean and simple style to bring out the best in your plants. A simple yet elegant planter, perfect for any garden. Finished with a metallic black bronze paint for a decorative, elegant effect. Suitable for a wide range of planting, including bedding, bulbs or even small standard trees and dwarf shrubs. Made from heavy duty polypropylene - UV stable, weather resistant, resusable and have drainage holes already inserted. Supplied as a 17.5cm (7in) diameter pot. 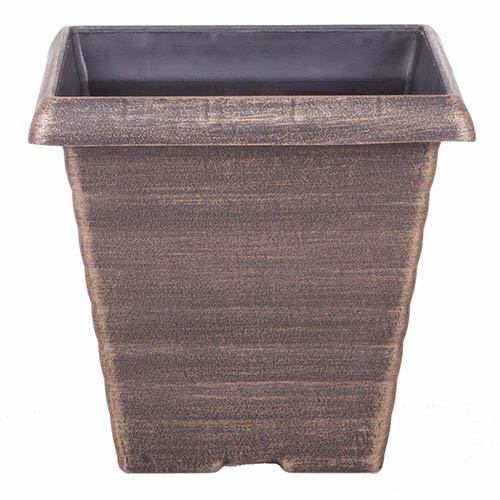 This metallic bronze finished square planter is simple and elegant and will fit perfectly into any garden – big or small, traditional or contemporary. Suitable for a wide range of planting, it'll add a decorative touch without overdoing it. Plant up bedding and bulbs or why not try a small perennial or a dwarf shrub that will add height and structure to your patio, terrace or even balcony displays! Supplied as a square pot, 17.5cm (7in) wide and 19cm (8in) tall, with a volume of 3.8 litres. (Dimensions are approximate).